(Nanowerk News) Techniques for creating complex nanostructured materials through self-assembly of molecules have grown increasingly sophisticated. But carrying these techniques to the biological realm has been problematic. Recently, scientists from Northwestern University used self-assembly under controlled conditions to create a membrane consisting of layers with distinctly different structures. Now, working at the U.S. Department of Energy’s Advanced Photon Source (APS), the team utilized small-angle x-ray scattering (SAXS) to better determine these structures and study how they form ("Electrostatic Control of Structure in Self-Assembled Membranes"). This new information paves the way for design and synthesis of hierarchical structures with biomedical applications. Fig. 1. Schematic illustration of a sac enclosed in a three-zone membrane, formed as a drop of HA in solution falls into a PA solution. The innermost layer (1) is a gel of HA molecules. It is surrounded by a layer of nanofibers lying tangentially at the sac’s surface (2), out of which nanofibers emerge perpendicularly (3). Peptide amphiphiles (PA) are chains of amino acids tipped with other molecules so that one end is hydrophilic (mixes well with water) and the other hydrophobic (not fond of water). In aqueous solution, PAs form long, thin nanofibers as the amino acid chains bind to adjacent chains to form β–sheets. 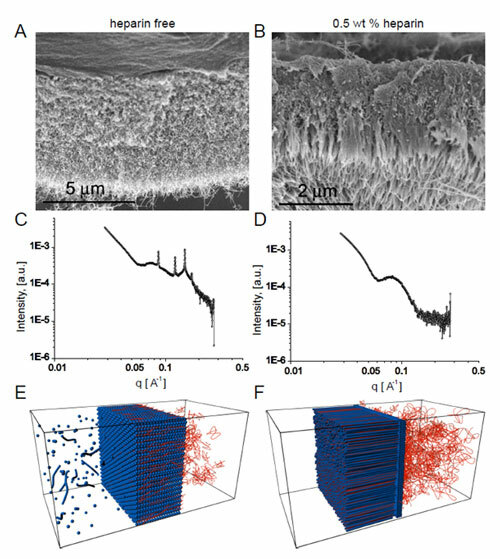 The Northwestern University scientists had previously found that when an aqueous solution containing positively-charged PAs was put into contact with an aqueous solution of negatively charged hyaluronic acid (HA — a large biological molecule that occurs in connective and other tissues), a dense, fibrous layer formed within milliseconds, creating a barrier that kept the two solutions from mixing. More precisely, the researchers found that the fibrous layer prevents aggregated PAs from migrating to the HA side, but allows HA molecules to slowly insinuate themselves through the barrier to the PA side, on a timescale of minutes or longer. The result was a three-zone membrane structure: a gel-like layer on the HA side, a fibrous mat consisting of PA nanofibers lying in the plane of the interface between the solutions, and a coating of fibers directed perpendicularly away from the interface and formed by electrostatically bound complexes of PA and HA (Fig. 1). The team’s interest in these membranes hinged on possible biomedical uses in which the peptide sequence forming the nanofibers would have a chosen biological activity. In one example, they incorporated a heparin-binding sequence to promote angiogenesis (the formation of new blood vessels), so that the membrane might assist with tissue repair. For the three-zone structure to form, the researchers found that the HA solution had to contain heparin in a certain concentration range. 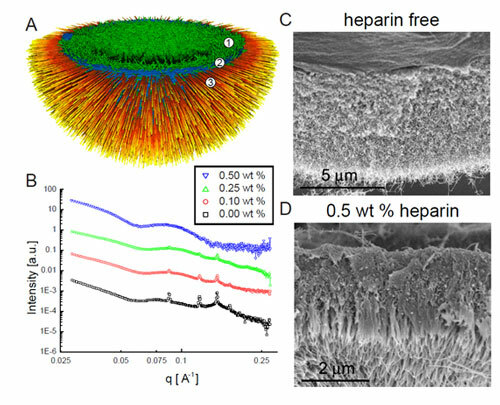 Scanning electron microscopy clearly showed linear structure crossing the membrane that formed when heparin was present at 0.5% by weight (Fig. 2a), in contrast to the more homogeneous appearance of the membrane created in the absence of heparin (Fig. 2b). Fig. 2. Scanning electron micrographs show the homogeneous membrane that forms in the absence of heparin (A), while in the presence of heparin is a fibrous structure forms transverse to the membrane (B). The scientists turned to SAXS at the DuPont-Northwestern-Dow Collaborative Access Team beamline 5-ID-D at the Argonne APS, an Office of Science user facility. These studies yield insight into the precise structure of the three-zone membranes and a better understanding of the dynamics of their formation. The heparin-free membranes produced well-defined Bragg peaks, while the three-zone membranes did not. Moreover, membranes that arose in the presence of smaller heparin concentrations showed larger Bragg peaks than those produced when the heparin concentration was higher, indicating a competition between two structures whose outcome depended on heparin levels. A time-series of SAXS measurements on a heparin-free experiment showed that the Bragg peaks began to form a few minutes after the two solutions were brought into contact, and reached full strength after about 45 minutes. Interpreting the SAXS findings in the light of their previous experiments and the known properties of PAs and HA, the scientists explain the differences between the two types of membrane as the result of different kinds of aggregation. In the absence of heparin, the PA and HA come together in nanospherical aggregates that pack together in a cubic arrangement, over a period of some tens of minutes, to form a membrane that generates well-defined Bragg peaks. When heparin is present, by contrast, it binds strongly with the PA and alters its interaction with AH molecules. In this case, a barrier of nanofibers lying parallel to the solution interface forms immediately, then acts as a diffusion barrier through which HA slowly passes. As it emerges on the other side, it binds to PA to form nanofibers that grow perpendicular to the interface. This ordered nanofiber array produces no Bragg peaks. The increased understanding and control of these processes derived from this research could make it possible to build bioactive membranes with a variety of structures and purposes.